“Florence works” might well be the slogan for the blue-collar district of Oltrarno, Florence, just south of the River Arno. 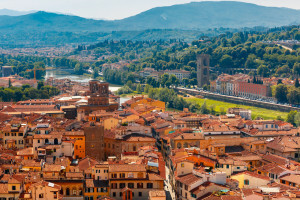 “Bohemian” also comes up frequently when describing this district, part of which lies in Florence’s historical center. Spring is considered the best time to visit due to comfortable temperatures, but expect showers. Autumn is also good, especially for food and wine lovers. The museums and streets are a bit quieter than in summer, which is the height of tourist season. Note that Florence summers tend to be hot and quite humid. Museums in Oltrarno include the Bardini Museum, which focuses primarily on sculpture and the Gallery of Modern Art. This region also houses the Museum of Porcelain and the Museum of Silver, in addition to the Specola, whose collection has a scientific focus and includes anatomical was models. The Pitti Palace is Florence’s largest museum complex and once was home to the Medici family. Its vast collections include works by painters such as Raphael, Perugino, and Titian. The magnificent Boboli Gardens are just behind the palace. These sculpted gardens feature fountains, grottos, pergolas, and a coffeehouse. The Church of the Holy Spirit, designed by Brunelleschi, is known for its lavish art and altar pieces. Many other smaller churches worth stopping in can be found through Oltrarno and its neighboring districts for those interested in sacred art. 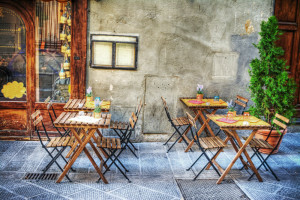 Oltrarno’s food offerings are as plentiful as any other Florence district, with hearty Tuscan fare. Some high-end restaurants can be found, along with food trucks, sidewalk cafes, and “hole-in-the-wall” eateries that locals swear by. 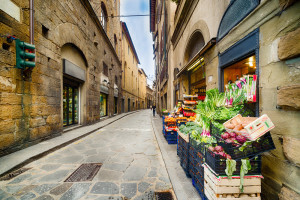 Devoted foodies may also shop in a food market for specialty cheeses to snack on and ingredients for the ultimate home-made Italian feast if they have access to a kitchen. Asparagus and artichoke are among the most popular vegetables on on Oltrarno menu. Pork, beef and small game fowl top the meat choices. Brave diners may want to try tripe, which is popular throughout Florence. Bread is everywhere in Oltrarno, with a seemingly endless variety to sample. The same goes for cheese. The best place to stroll amid Florentine artisans’ shops is between Via Maggio and Piazza Pitti. Visitors watch violins, books, iron work, handmade shoes, and costume jewelry all being created in this small, walkable area. Woodworkers and sculptors also populate this area, known for its Medieval feel and family-run shops. Mosaics, gilded wooden frames, and marbled paper are yet more special crafts found in Oltrarno. Buying direct from these workshops means paying less plus supporting Oltrarno’s craft community. Such purchases often come with a story to tell back home. This part of Florence has housed skilled artisans for centuries. Some craftspeople still create their wares as their ancestors did while others have put a modern spin on their trade. Oltrarno sits in the middle of historic Florence, just across the river from other Florence landmarks like the Museum of Galileo. This city center was named a UNESCO World Heritage Site in 1982 because of its many museums, monuments and ongoing vibrant culture. The Duomo with its vast cathedral and the Uffizi Gallery is also part of Florence’s historic and artistic center.